As we had our 10 years anniversary last year – the NGO was officially formed on 8 November 2008 – I spent some time reflecting how this whole thing came to be and how it all developed. And I’m happy to share these thoughts with you in this blog post. 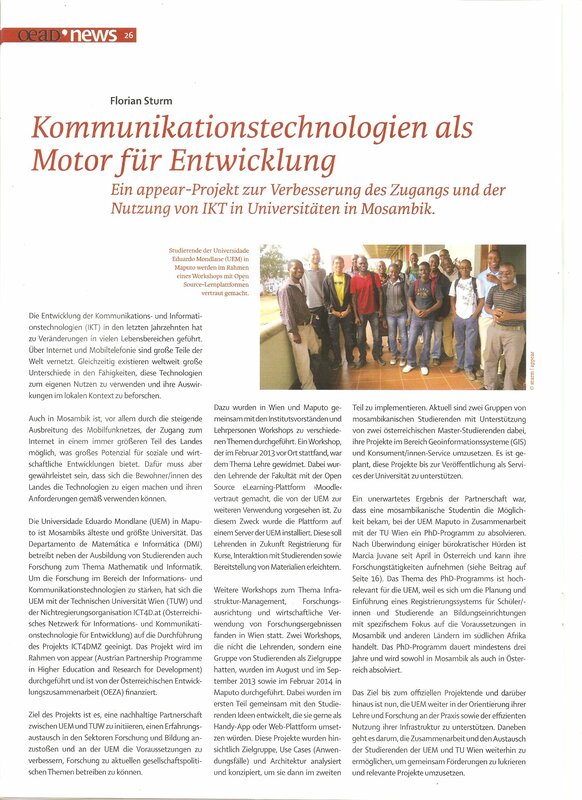 The reason why I got interested into the field of ICT4D is connected to my year of Erasmus student exchange during my Master studies in “Wirtschaftsinformatik” (management information systems). 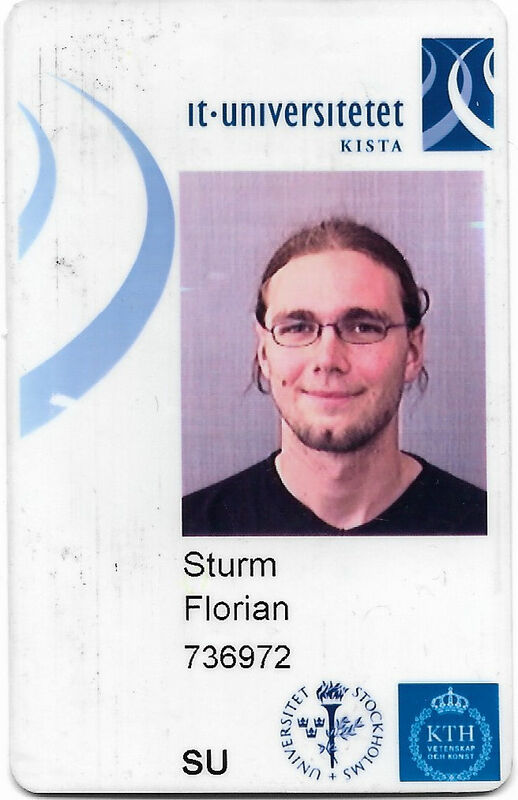 I went to Sweden from August 2006 to July 2007 and attended several courses at the Department of Computer and System Sciences of the University of Stockholm. 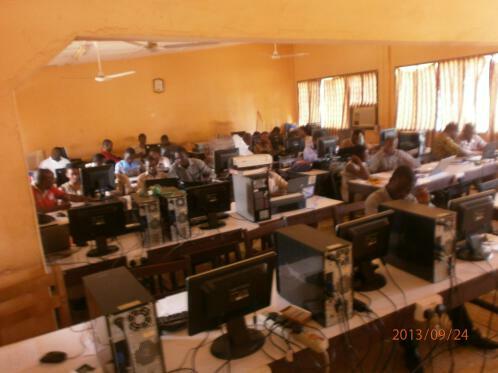 At that time they had a Master course in ICT for Development with several courses which I got interested in. Nowadays, there’s no Master course anymore but still a research focus on ICT4D (https://dsv.su.se/en/research/research-areas/ict4d). There were hardly any “Westerners” doing the course, but a lot of people from Bangladesh, Iran or Pakistan. The courses were rather theoretical in nature, but still it got me hooked – I always wanted to do “something good” with my studies. So after this year in Sweden I wanted to pursue my interest in ICT4D further, but there was nothing similar like these courses at any university in Vienna. But still I made the topic ICT4D one focus of my Master thesis which I started in 2008 (- can still be downloaded here by the way: http://othes.univie.ac.at/3571/). In the course of writing it I was pointed by a common acquaintance to Martin Konzett who had also a big interest in ICTs connected to Africa. He is a coder himself and has personal ties to Zanzibar. 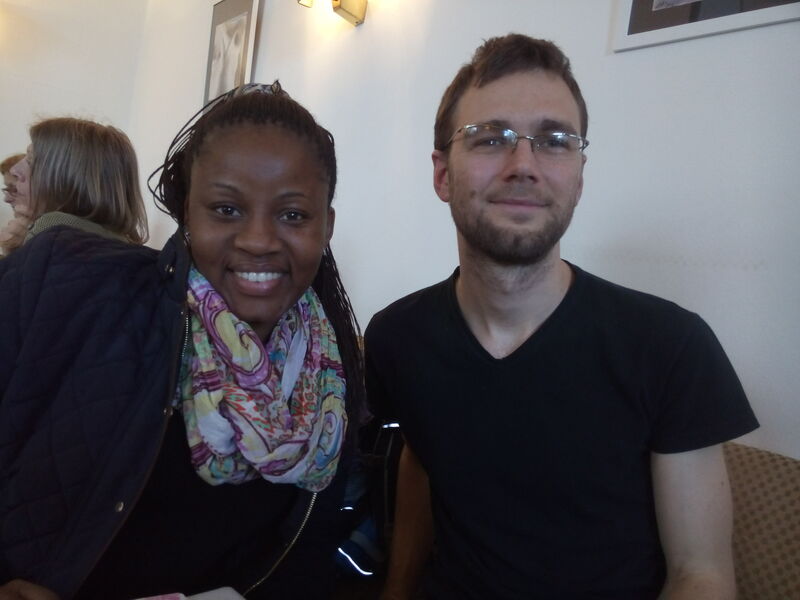 We met at a cafe in Vienna and he was super enthusiastic about starting an organisation in Austria, doing a movie, a blog, going to conferences and starting projects. He had also the concrete idea to develop the organisation to run as a business – e.g. through outsourcing programming or web design to Africans we had educated in a project. I found all this very exciting and we decided to join forces. Our first concrete activites were the movie Hello Africa and this website and blog. For the movie Martin went with Martin Tomitisch (lecturer in Human Computer Interaction – he became the third co-founder) and Anders Bolin (film maker) to South Africa and Tanzania to document how everyday life in these countries was connected to mobile phones even then already. At that time people in Austria hardly thought of Africans as mobile phone users. The movie – called “Hello Africa” – got great feedback, was shown on festival and watched by many people. It was released under CC-license, so it can still be watched on Vimeo for free under https://vimeo.com/4664795. 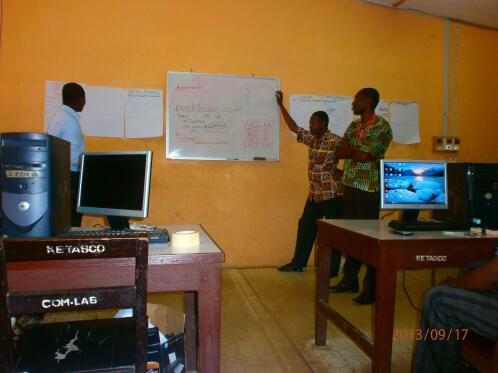 The blog started on 28 April 2008 with a definition of the term “ICT4D” as the first post. In the beginning Martin and me published a blog post almost every day. We referred to all sorts of ICT4D projects, news articles and documented our own activities. To gather content and to document the whole ICT4D research scene we also went to several conferences and ICT4D-related events around Europe. There we interviewed researchers, activists and policy makers and put the videos on our Youtube channel and blog. 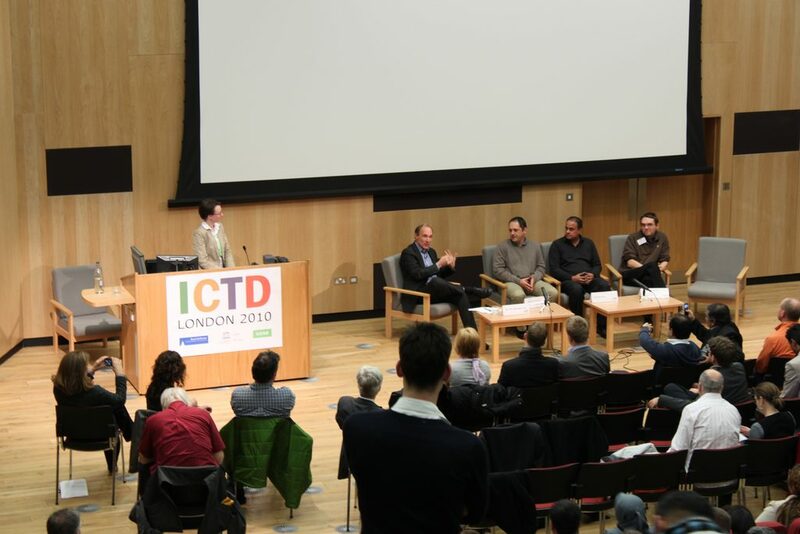 My “highlight” was the ICTD2010 conference in London (http://www.ictd2010.org/), where we interviewed Tim Berners-Lee, Geoff Walsham, Ineke Buskens or Tim Unwin among others. I still remember the interview with Tim Berners-Lee, because I was super nervous and the questions I asked him weren’t very smart. All the videos are still up on Youtube – https://www.youtube.com/user/ict4dat/videos. Several people joined at this time. 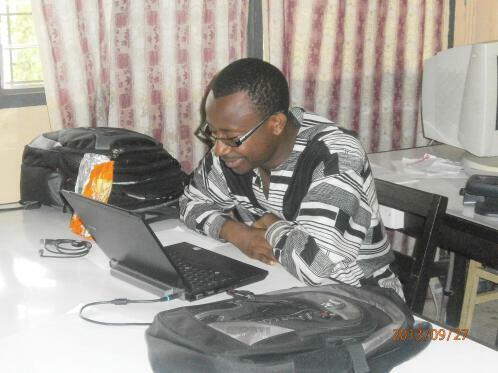 Worlali Senyo, a Ghanian ICT research analyst became interested in our NGO and became a member. He has been supporting our efforts in Ghana ever since. 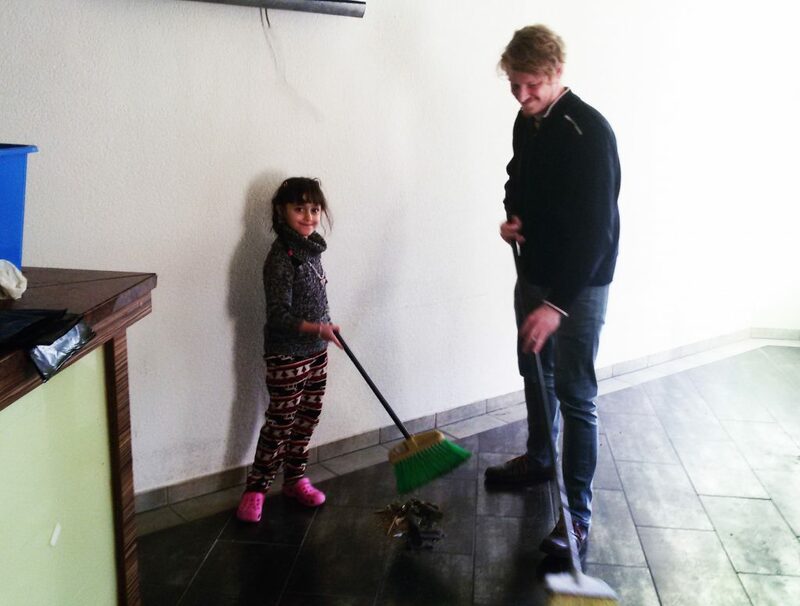 Also Isabella Wagner (then – student of the master course “Society, Technology, Science”) joined the NGO. Through the movie project and Martin’s ties to Zanzibar we started our first project there in 2009. 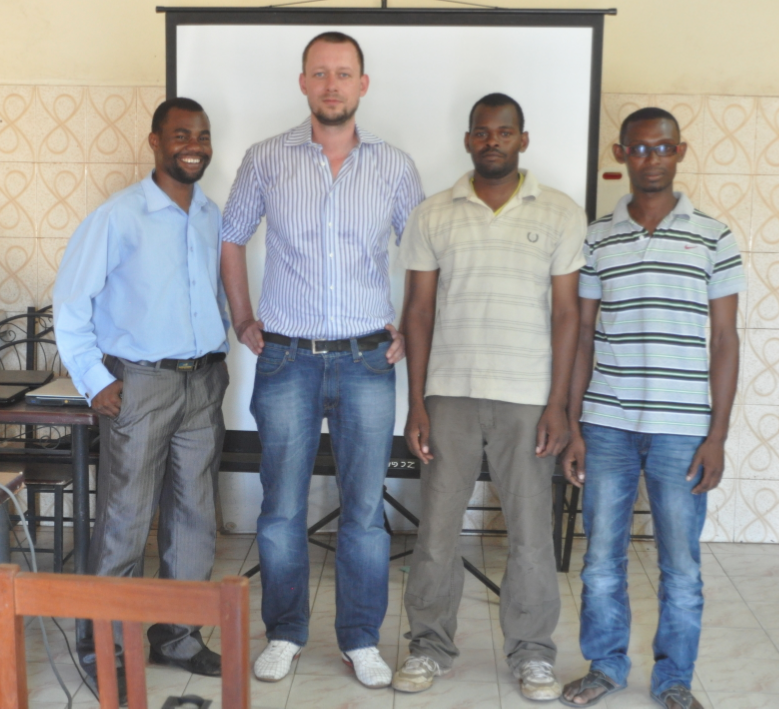 It was called “Zanzicode” (http://zanzicode.ict4d.at/) – inspired by the project “Zanzibits” which also took place there at that time. (http://zanzibits.blogspot.com/) The aim of Zanzicode was to “help build the personal careers of our graduates as well as to kickstart a local web development community”. 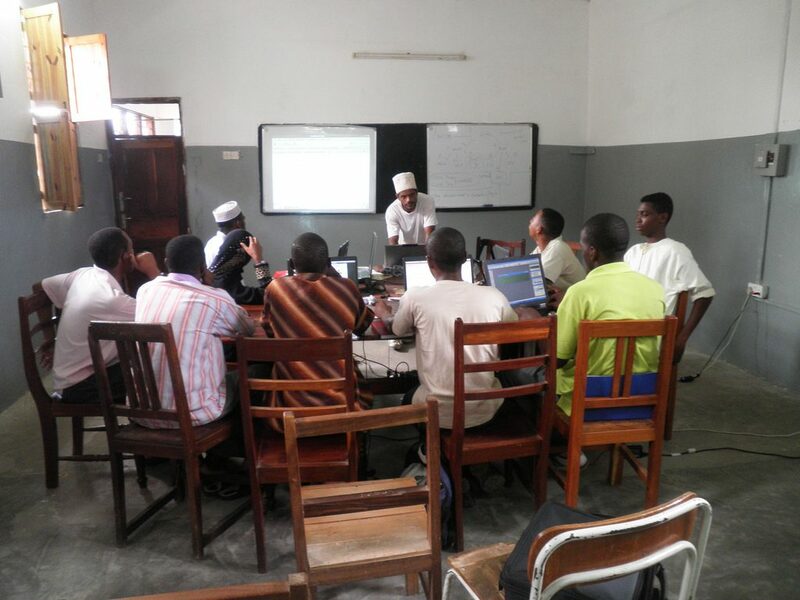 To achieve this, we “provided free education in the field of Web Development to a small number of talented and motivated students of poor background in Zanzibar, Tanzania”. 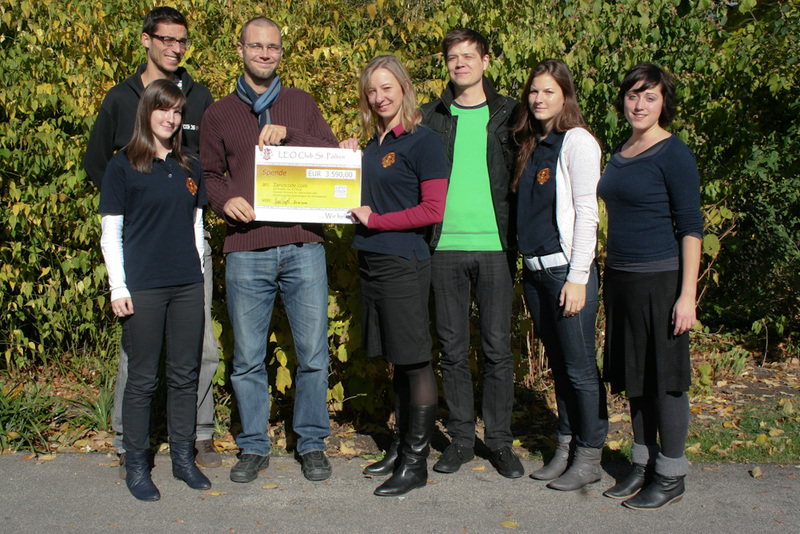 We got a little funding from the Austrian Development Agency for this project and also the NGO “Leos” from St. Pölten gave us a donation. The courses ran for around two years in total and we had different people teaching programming on the spot – first Martin himself, Dan Hamm and Fritz Grabo (then informatics student at TU Vienna) who joined the NGO afterwards. All in all the project was ambitious but rather small and worked quite well. After two years we didn’t have anyone on the spot any more who was willing to organise the courses in a way we thought made sense, with a strong focus on Open Source. So we terminated the courses around 2011. Afterwards it became a bit more quiet, also due to Martin Konzett moving away from Vienna and investing less time in the NGO. We experimented with ICT4D “Stammtisch” in Vienna where several people attended over the years – for example Christoph Derndorfer from OLPC News. We also had guest lectures at the university from time to time. We also worked on the book “Social Business Forge” – focusing on tax and business issues around the field in which our NGO was active. This project was spearheaded by Paul Pöltner (then – student at TU Wien and aspiring tax consultant), who also initiated our next big “development”-project. The valuable lessons learned from this project were, that although there’s huge potential in the motivated students and teaching personnel at this particular university, it’s hard to create a sustainable impact, even though the project budget was fairly large compared to our other projects. 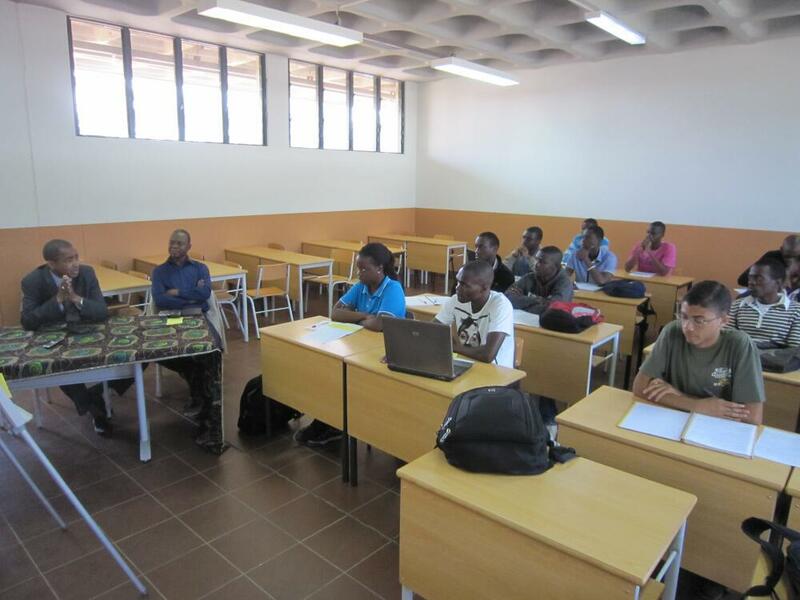 We educated personnel which would eventually leave the university and work in the private sector, funded unnecessary hardware and had a hard time wrestling with university bureaucracy on the Mozambiquan side. We applied for follow up of this project – as this would have made it possible to profit from these experiences, but funding was denied although we handed in the application three times. We still have ties to the university, with Paul supporting some students in their app-programming efforts (see e.g. 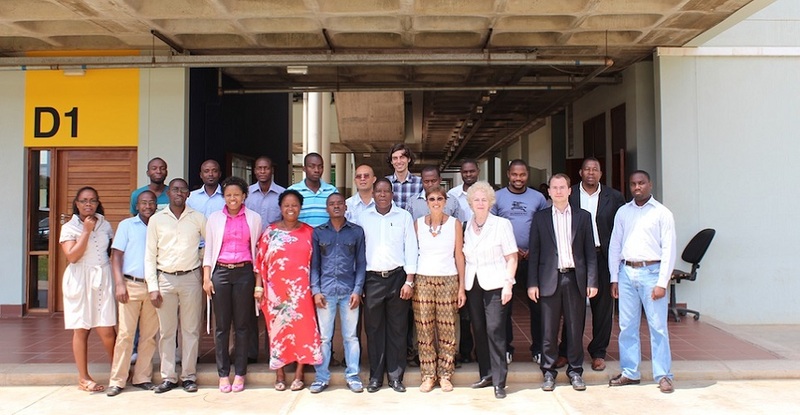 this blog post: https://www.ict4d.at/2015/09/06/ourmoz-wins-world-banks-apps4maputo-contest-in-mozambique/) and also with our project partners, but no other funding opportunity has come up in the mean time. Another project which started at about the same time, in 2012 also had a big impact, even though it relied almost exclusively on voluntary work. 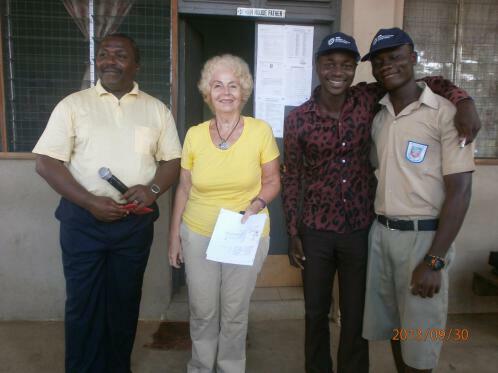 Our member Margarete Grimus initiated and carried out this project in partnership with several students and staff of the Keta Technical High School in Keta, Ghana. The project focus was on using available technology, such as the mobile phones of students to create teaching materials from the internet. For this, she spent some time in Keta for three consecutive years, one time joined by another new member – Michael Pollak – to teach staff and students about difference ways to use the internet for teaching. Here’s a post of her stay there in 2014: https://www.ict4d.at/2014/06/20/news-from-ketascomobile/. Through the project in Mozambique and other small activities, Paul Spiesberger became more and more involved in the NGO. In 2015, when I felt that I had led the NGO long enough, he decided to take over the role of chair person and has acted in this role since. I’m grateful to have been able to pass over this role to him, as since then new energy has come and we have become more active again. 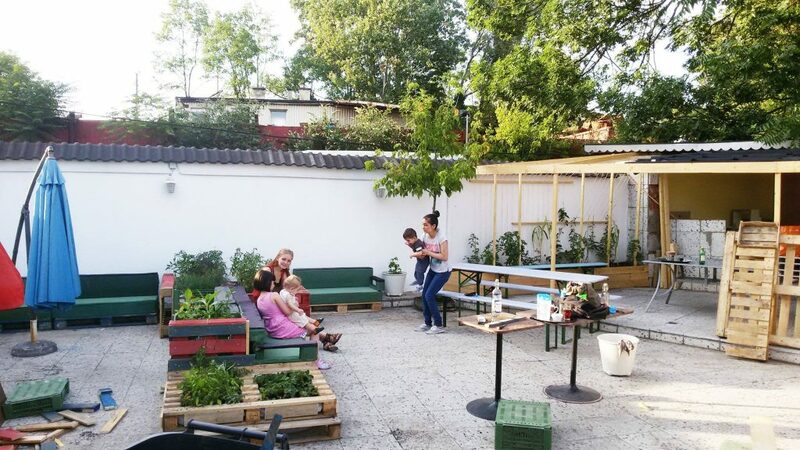 The first signs of this new activities were the involvement of Georg Steinfelder (graphic designer & artist) and Chloe Zimmermann (architect), who joined together with Paul, in the Nimble Building Days, improving refugee housing in Austria – https://www.ict4d.at/2017/04/10/nimble-building-days-3-integration-through-collaborative-work/. Also Alvaro Valverde, development professional at CABI has become engaged in the NGO in 2017 and is supporting us since with his experience. Right after our 10 years anniversary party in November 2018 we had at our annual “vision meeting”, several new possibilities emerged for the NGO. One is the Erasmus+ project “Yes We Care 2”, which allows us to network with NGOs from Macedonia, Romania, Namibia, Mozambique and Zimbabwe around the topics of Social Entrepreneurship. Another is the project TEQtogether, which is committed to changing men’s attitudes and behaviours towards women and technology – https://www.ict4d.at/2019/02/25/teqtogether-teams-up-with-ict4d-at/. 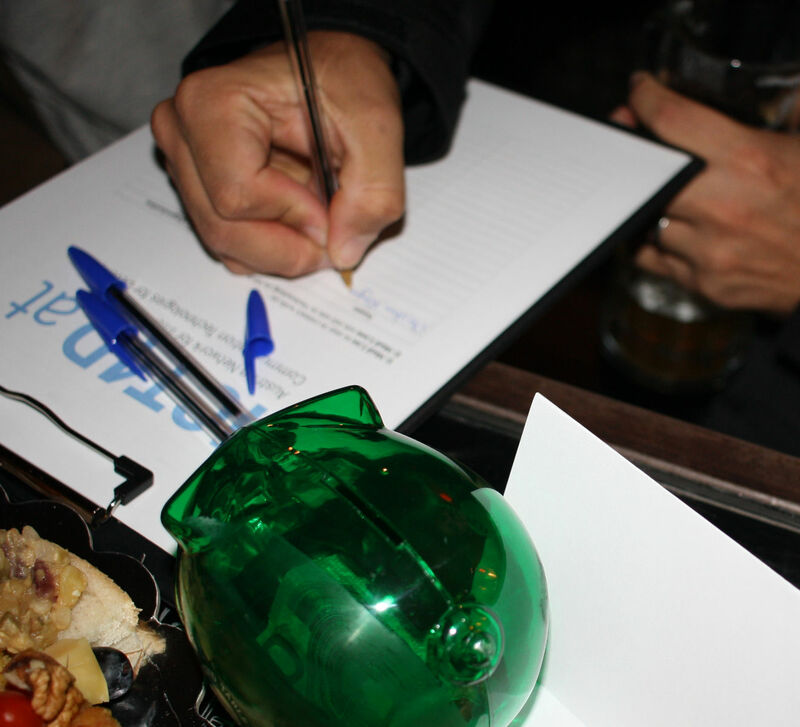 More projects are in store and potential new members are motivated to get more active. You’ll hear about that on this blog for sure! I’m looking forward to 10 more exciting years! 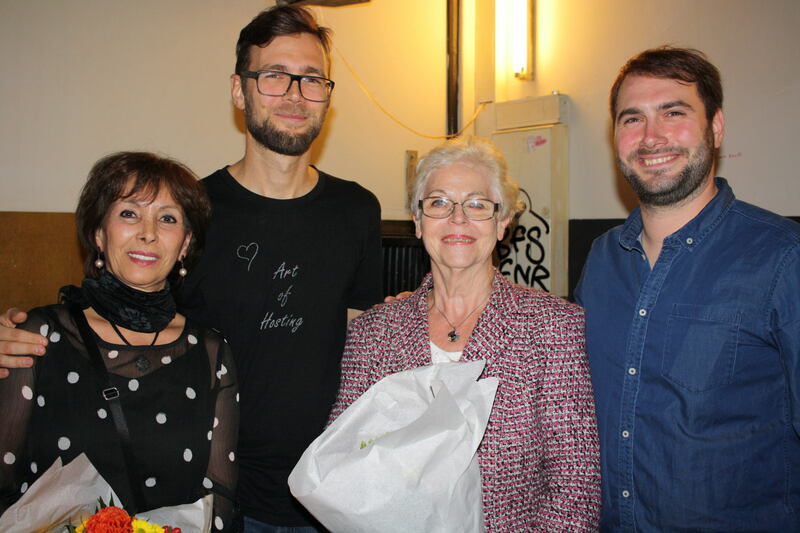 Last week on Wednesday, 31.10. we had a little party in Vienna to celebrate the NGO’s 10 year anniversary. We tried to think of every current and former members to invite – and also all Austria-based supporters, partners and friends (I hope we didn’t forget anybody). It was nice to get in touch again with some people we haven’t seen for a while – like Christoph, who used to work for OLPC and is now busy with teaching computer basics to kids with his NGO TechnikBasteln or Paul who coordinated the ICT4DMZ project for us and is now super busy in his crowd investment company CONDA. And it was also great to get to know new people interested in the ICT4D field. The setting was rather informal. Paul and me did a short intro speech and then we had two bands playing – the band I’m in and Georg’s band. Chloe, Georg and Paul had made an effort to create a poster for every project we did so far before and we decorated the party venue with these posters. Thanks a lot for that! You can download the project posters under this link. Thanks a lot also to Margarete and her friend Sarah who prepared a buffet for us! We collected some donations from our guests and will give them to Noah to support his efforts in spreading progamming skills with Python and Django in Ghana. Thinking of our activities in the past 10 years brought back a lot of memories. It’s amazing that we still have our blog after all this time and that all the old posts are still available – a great resource to see how we and maybe also the ICT4D field have changed in these years. It made we want to write another blog post looking back these 10 years, but that will take some time. On the weekend following the party we had another vision meeting with several members and this brought a lot of energy and insights – but we will write about that also in another post. For now I’d just like to express my thankfullness to everybody who every contributed to our NGO and helped shape our path in the past 10 years. 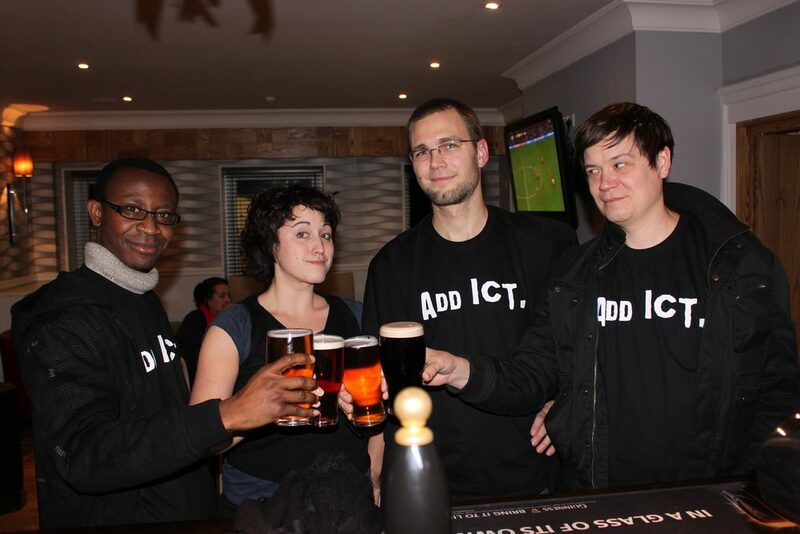 Happy birthday ICT4D.at! Next Monday, 17.11. we will be holding a small presentation about the topic ICT4D at University of Technology Vienna. We were invited by the Austrian chapter of Engineers Without Borders to contribute to their series of lectures about different topics concerning technology and development. We will give a broad overview of the topic and an insight in current development. If you’re around Vienna make sure to come by – it’s on Monday 17.11, 18:00 in the TU Wien lecture hall BD02a (Getreidemarkt 9, 1060 Wien). 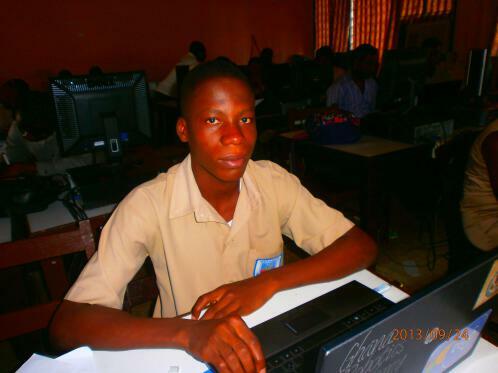 ICT4DMZ – PhD student from Mozambique – Welcome! 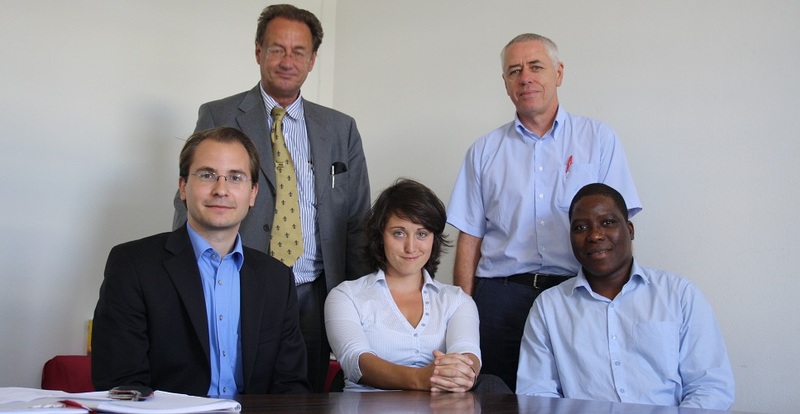 In the course of our joint program with University Eduardo Mondlane Maputo and Vienna University of Technology – ICT4DMZ – we have also managed to get funding for a Mozambiquan student to come to Austria for a joint PhD program in informatics. Two weeks ago Marcia has finally arrived in Vienna and is starting her studies now. Welcome Marcia, we wish you a productice and enjoyable time here. Thanks to APPEAR, the Austrian Partnership Programme in Higher Education & Research for Development and of course our project team to make this happen! 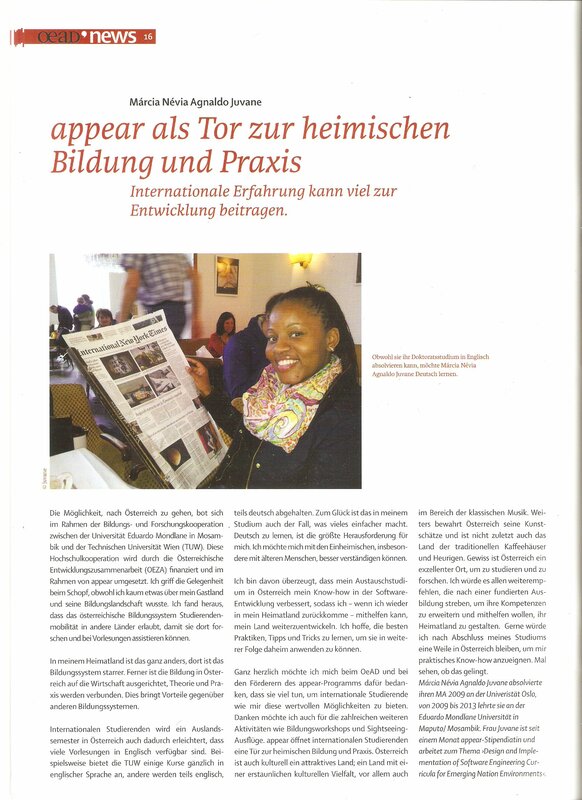 Our member Margarete is busy writing her thesis and has in the course of this recently published a paper about her experiences in Ghana. Grimus, M.; Ebner, M. Learning and Teaching with Mobile Devices – An Approach in Secondary Education in Ghana. In: Proceedings of the 10th International Conference on Mobile Learning 2014. IADIS (International Association for Development of the Information Society), Inmaculada Arnedillo Sánchez and Pedro Isaías (Eds.) March 2014. ISBN: 978-989-8704-02-3 © 2014 IADIS, pp 66-74. She has also held a presentation at the university of Graz about “Societal aspects of the information technology – mobile learning: chances in education for sub-sahara Africa, e.g. 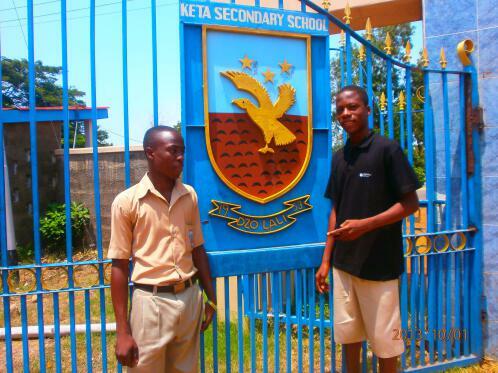 in Ghana”. Below you can watch it – it’s in German. 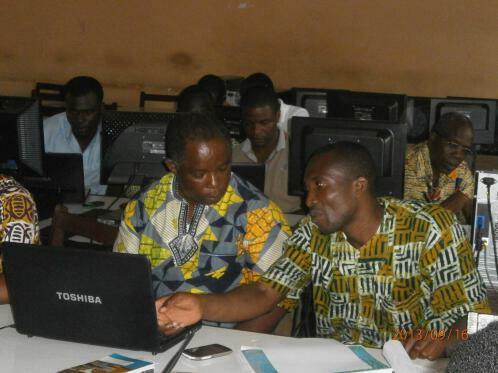 https://ict4d.at/2012/10/06/keta-project-looking-back/) a follow up workshop on the topic “Learning and Teaching with Digital Technology had taken place in September 2013 in Keta. The school is still growing and hosts now about 2.800 students, another 15 classes in a new block open next year. Creation of a personal digital portfolio. Didactical methods: Evaluation of digital learning material e.g. Open Content, OER. Guidelines for Best practice: Mobile phones for learning’. support was highly appreciated and contributed to the success of the workshop. Content of developed Courseunits (micro-content) developed by teachers and students units (small groups, 1-2 teachers+ 1-2 students). Assessment of course-structure, -design, suitable for small screens, visualization/images. Output as epub and pdf. Challenges were seen in the frequent power outages, which impair the work in the computerlab. Noah is also the tutor of a team working on robotics. They prepare to participate in a comettion on robotics. teaching and learning. Teachers were encouraged to pass their learned skills on to students and colleagues afterwards. In the opening ceremony the headmaster reported to all students and teachers about the new trends coming up in education. 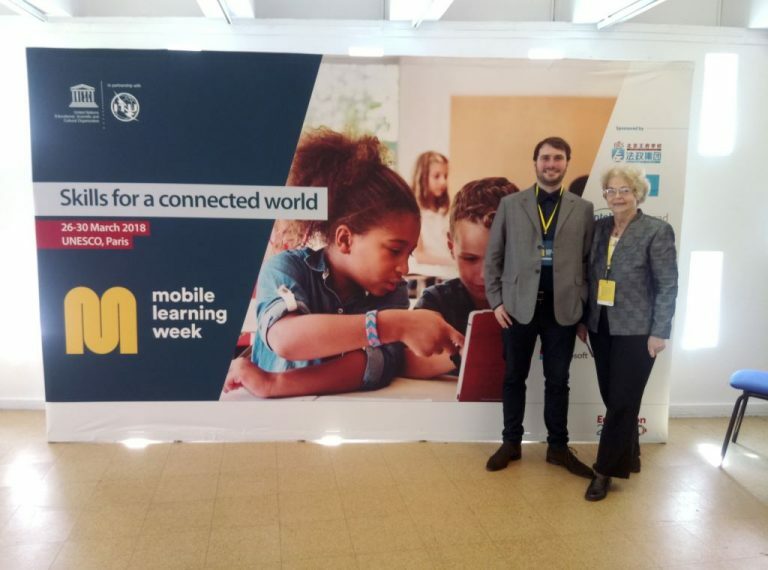 He addressed that this could help to become critical thinkers, referred to new didactical methods and benefits by integrating mobile devices in learning and teaching. He proposed a reform of the guidelines for the use of mobile devices at school. 14 teachers were handed over their certificates of successful completion of the workshops. 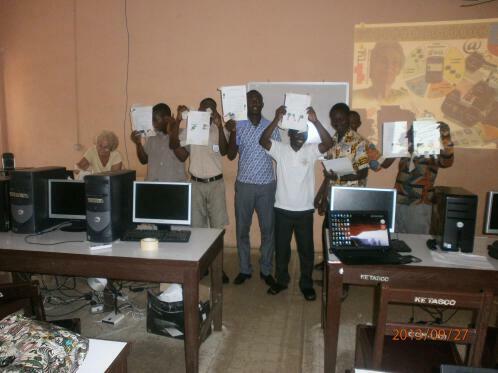 Finally 4 laptops from Austrian donors were handed to the school to benefit students and teachers in the new built library. We hope that the expertise gained in the workshops will affect further developments. The support to the Workshops with mobile devices (mobile phones and laptops) and the provided prices have contributed a lot to the success of the project. This is why I would like to thank Mr. Tom Trauner for assembling of the phones and the donation of lot of material. My thanks address also the Austrian Computer Society which supported the project with pen drives, T-shirts and caps. 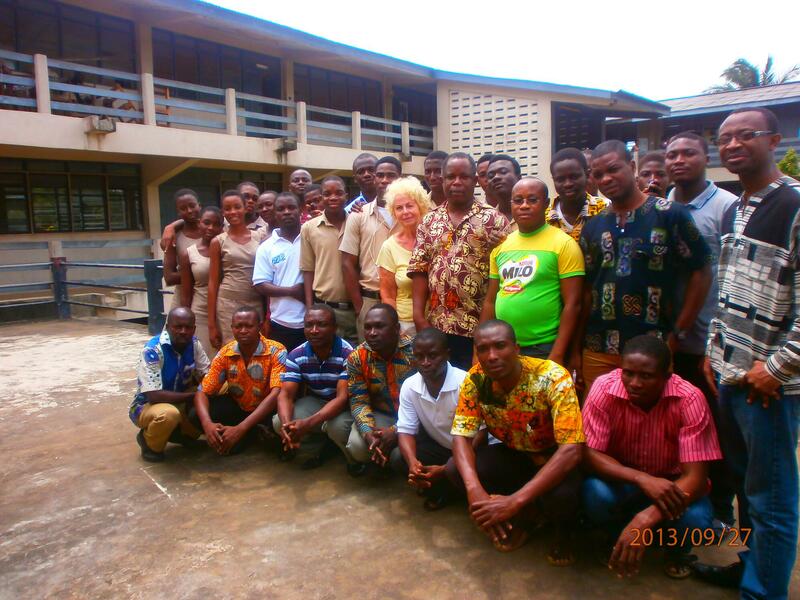 Many thanks to the anonymous donators who supported the project with laptops via mediation of Dr. Baumer. Particularly I would want to thank my mentor, Univ. Prof. Dr. Martin Ebner of the University of Technology Graz, who helps me any time with advice and suggestions; his contributions benefit a lot to the success of the project. Anders and me are back in Austria now after an exciting month in Mozambique, working for the project ICT4DMZ at the Universidade Eduardo Mondlane in Maputo. We had a great time and would like to thank our partners on the spot, Emilio Mosse and Andrei Shindiapin. 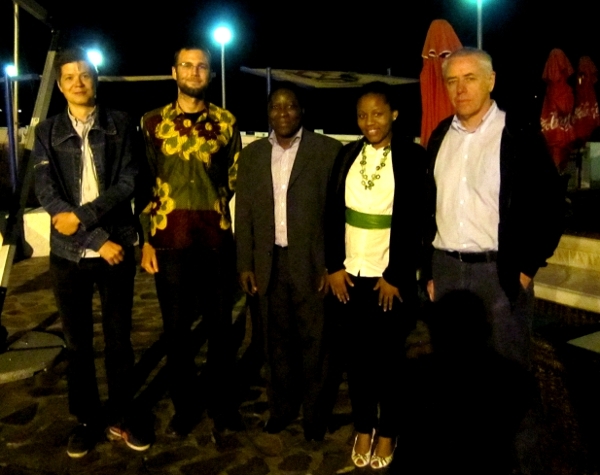 Below there’s a group picture with them and Marcia, a future PhD student in Maputo and Vienna. We are very happy that we can offer her this opportunity together with APPEAR and TU Wien. All in all we have had quite some time in several lessons with the students to bring forward the concepts for the two applications they were interested in creating. In this blog post you can find some pictures of how we worked together. Of course after three weeks we could only touch some things and the use case diagrams, list of system components, UML diagrams and mockups we created are a first draft only. However, I’m proud of everything we produced and it gives a good impression what the applications should do. 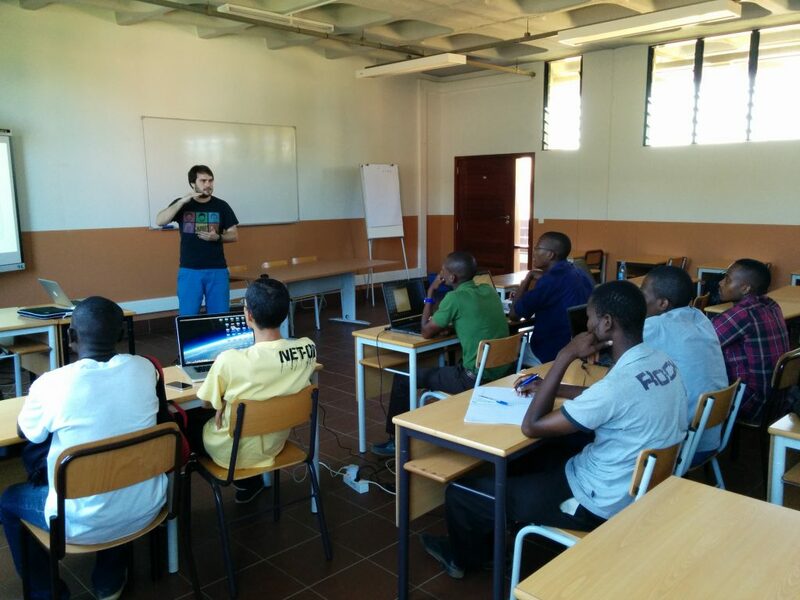 Now it’s up to the students and their supervisors to work on the projects until February, when two colleagues, Paul and Philipp will come to Maputo to deal with implementation of the two applications. We will try to keep in touch with the students and hopefully they will find time besides their many duties at university to continue their efforts with “Safe Maputo” and “Complaint Center”. Additionally to the course, Anders and me held two presentations for students of informatics and journalism about current developments in media. 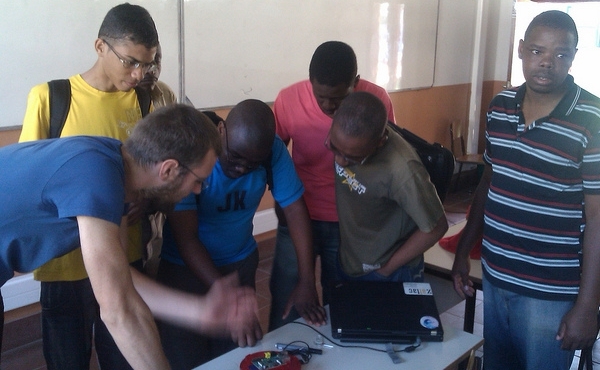 We dealt with topics as diverse as the Raspberry Pi or PRISM and received a good deal of interest. Finally I can only express my hopes that what we’ve said and done has helped the students broaden their horizon in general and increase their insights into software creation. I had a good time working with the students and am looking forward to keep in touch and observe the development of the applications. After two weeks course with the interested and motivated students at Universidaded Eduardo Mondlane the two applications take shape. We have identified users, use cases and system components and have been working to define these system components in detail. For this we haven’t worked with computers but mainly with moderation cards – a method I prefer to give the students something real to touch and move around. For the Complaint Center we’ve already had an interview with the president of the consumer rights organisation DECOM (Associação de Defesa do Consumidor) where the students could present their idea for the website and receive valuable feedback. 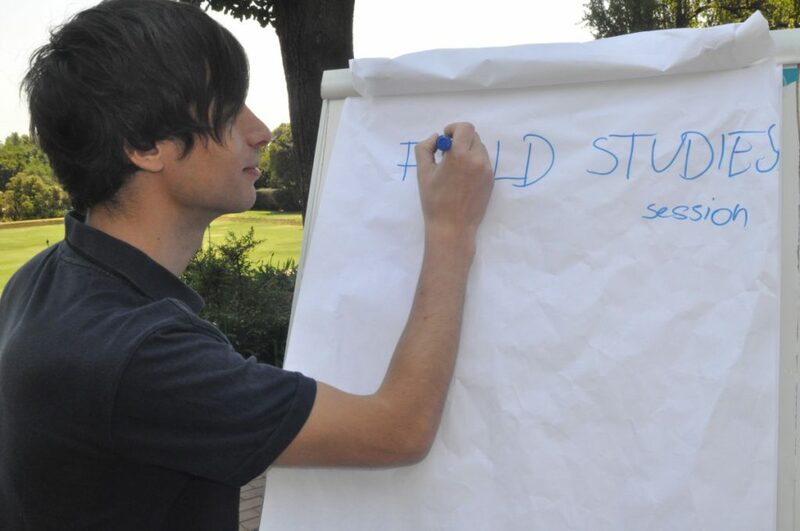 Also we have worked a lot in smaller groups – focusing on frontend, backend and geographical information systems. Below you find some pictures of the courses so far. The next step for this week is now to join the work of the different groups and create a first prototpye for the projects. 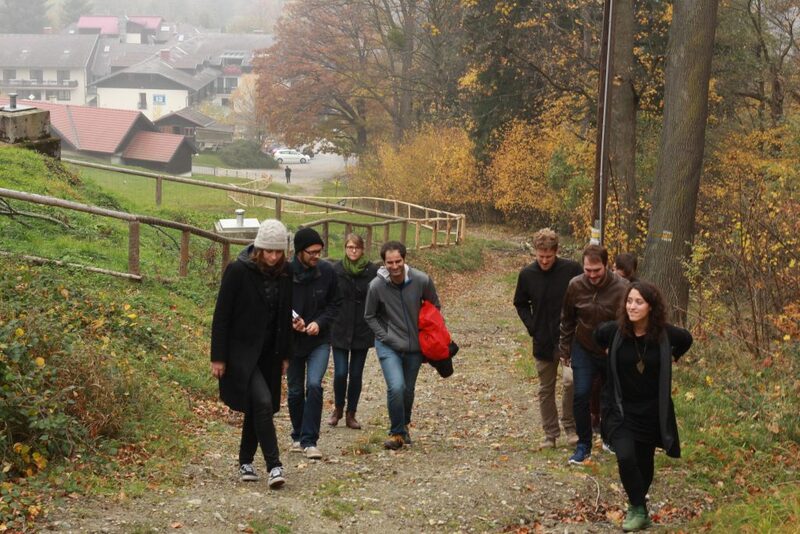 Afterwards, the next months the students will mainly work on their own – with supervision via mail. 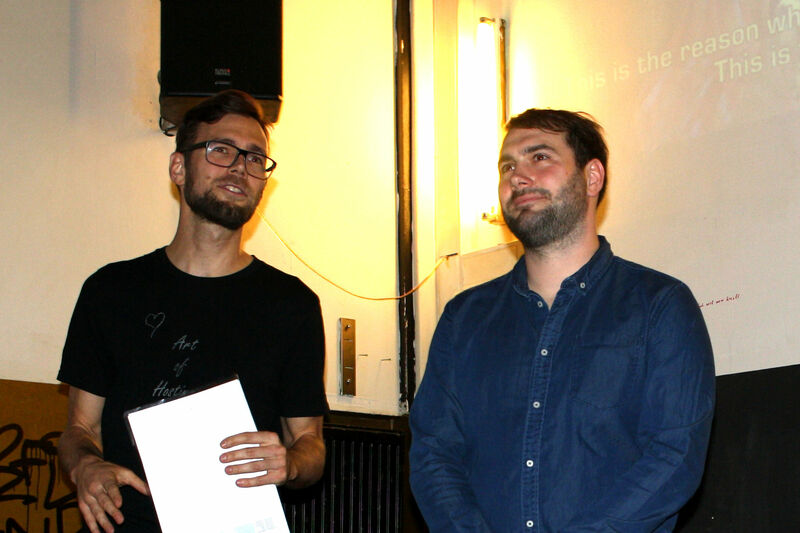 In February two colleagues – Paul and Philipp, both working on their Masters at TU Wien will come and carry on with the implementation of the applications. I’m curious if the application won’t already be finished to a large part by then – as the students show so much interest and dedication to make the two applications reality.